I don’t want this blog to get mired in politics, but this issue is too important for internet users and members of the creative industries in the UK (regardless of their political stripe) to ignore. The Rt Hon Lord Mandelson wants to give the music and movie industries the power to force UK citizens (and their families) offline on the suspicion of infringing copyright. His plans are unworkable and unlawful, and will do nothing to fix old media’s obsolete business models, while at the same time doing incalculable damage to the UK’s viability as a place to do business online. 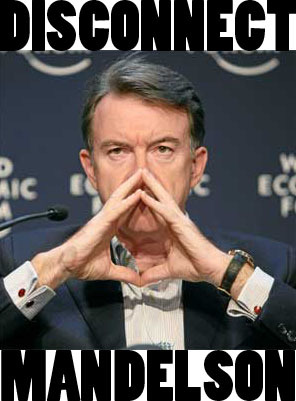 You can read more about Mandelson’s (increasingly ludicrous) plans here (Guardian) and here (BoingBoing). Cory Doctorow (yeah, I know) articulates what’s wrong with the proposals here (Guardian). This is not about piracy. (It’s perfectly fine for there to be reasonable, proportionate and legal means for rights holders to protect their work.) It’s about safeguarding access to the internet – something that has already been enshrined as a human right in Finland, France, Estonia and Greece, and which is becoming increasingly necessary to participate in society, be it for work, leisure, commerce, communication or access to public services.